A Game Plan for Caregiving™ | Who's Watching Mom?, Inc. Whether you are Watching Mom (or Dad) or a loved one, we can help you to understand best practices in dealing with the myriad of issues that arise during the challenges of caregiving and get you through the process with less anxiety and confusion. The process of caregiving can be tricky, time-consuming, and overwhelming, but we’ve helped many people through this before. Having a Game Plan for Caregiving™ is essential to assure a seamless transition through the caregiving journey. How to decide when it is no longer safe for a loved-one to live independently. 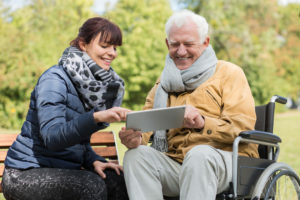 Creating a plan for payment for necessary long-term care services and assistance in obtaining these benefits, whether that be through long-term care insurance, Medical Assistance, Veterans Benefits or private funds. Understanding what happens to a loved one’s assets when they are receiving long-term care services, whether that be at home or in a facility. Determining a plan for the best and most appropriate caregivers for you and your situation. Provide guidelines or caregivers regarding personal choices for desired care. Creating a plan for the caregivers to avoid burnout. We can see you through any and all of these processes until your Game Plan is securely in place. Exploring options and timing that work best for your unique situation. Determining who your most appropriate caregivers shall be, what each will be responsible for and when each caregiver should step in for you. Creating decision makers and securing trust. Provide guidelines that assist your agents, trustees, caregivers and advisors to fulfill your goals and desires. Develop advanced protocols to minimize the risk of fraud and abuse. Steps to avoid family conflict. We offer one-to-one consultation to help you identify specific tasks on your Game Plan for Caregiving to-do list. Who’s Watching Mom? Inc. prides itself on providing individualized planning based on YOUR needs, wishes and desires. We listen and observe carefully to understand your situation in full so that we can provide the best possible solutions. We start with a free consultation during which we will assess your situation and determine if there is a fit between us; what you need and what we can provide for you. If we agree to work together at the first meeting and agree to a fee arrangement, we also discuss the scope of the project, “homework”, and future schedule of tasks to complete. A Game Plan for Caregiving™ involves numerous DecisionDays™ and may take several meetings to complete. Our services are charged on an hourly basis. Creating a Game Plan for Caregiving™ can take time and energy. We feel strongly that the money spent up front will save you thousands of dollars on the “other end”.